Should you include part-time or temporary work on your resume? There's no one answer to that question since it depends on the work itself and the role you want now. If so, it makes sense to include prior part-time roles — they count as relevant experience. Particularly if you are fresh out of school or applying for entry-level jobs, part-time jobs may be your primary form of experience. And even if a part-time job as a cashier isn't super-relevant to your desired career in marketing, there are likely on-the-jobs skills that you can highlight in the job description on your resume. If the part-time work is related to your career goals, include it on your resume and describe the position fully. Even though it might not be as significant as your previous full-time employment, it still shows continuity with your career. It can sometimes be difficult to know how to handle part-time or temp roles that you took during a period of unemployment, but if they're relevant to your industry and overall career, it makes sense to include them. If so, while you may want to still include it on your resume, there's no need to list it prominently. For instance, if you worked several shifts as a bartender for extra money while working full-time as an editorial assistant, you can leave off the bartending work from your resume. An exception might be if you are applying for a role as a food and drink editor — in that case, your bartending experience might be something worth including and mentioning during interviews. If you were in a part-time role for a long time — years or decades — then it's certainly worth including. Being in a role for a long period can point to your loyalty and dependability, which are characteristics that are often prized in candidates. Similarly, if a part-time or temp role eliminates a significant gap in your resume, it may make sense to include it. 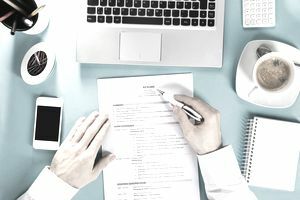 If you want to include temporary, part-time, consulting, volunteer, or other non-full-time experience on your resume, there are several ways you can include the roles on your resume. One option is to separate your work experience into two categories – one specific to the jobs you’re applying for, and the other for non-related employment. A resume profile is a brief summary of an applicant’s skills, experiences, and goals as they relate to a specific job opening. This is an example of a resume that includes information on part-time jobs. Download the resume template (compatible with Google Docs and Word Online) or see below for more examples. Creative and deadline-savvy food writer and editorial assistant leveraging superb digital publication talents to excel as a Food and Drink Editor. Writing / Editing: Proven ability to author and edit flawless, ready-to-publish content within challenging deadlines. Well-versed in Chicago and MLA style guides. Food and Drink: Solid “real life” food and drink industry experience developed as a Class 12 Mixologist, restaurant reviewer, and food blogger. Technical Proficiencies: Excellent command of Microsoft Office Suite (Word, Excel, PowerPoint, Outlook), Adobe Creative Cloud (Photoshop, Dreamweaver, Illustrator, InDesign), WordPress, HTML, and CSS. Key Strengths: Self-directed and energetic, working equally well in on-site and telecommunications work environments. Hone expertise in digital publishing as editorial assistant tasked with curating homepage for audience of 100,000 daily visitors. Locate and select photo and video content; author stories and headlines. Track web metrics. Demonstrated excellent command of basic video editing, social media, HTML, and CSS technologies. Contribute regularly to popular website and blog dedicated to exploring local Pacific Northwest cuisine. Develop, test, photograph, and publish recipes; author restaurant reviews. Instrumental in positioning website to achieve food blog awards in 2016 and 2017. Serve beer, wine, and mixed drinks to patrons of upscale restaurant in Seattle’s historic district. Develop original menu items and themed drinks for restaurant events; order supplies, restock bar, and ensure compliance with all governing regulations and food service standards. Another possibility is to leave irrelevant part-time or temporary employment off your resume. There is no obligation to include all your work experience on it. Think of your resume as being more like a "greatest hits" album than a "complete retrospective." If you are including part-time roles on your resume, you can choose how much to write about them. Base this decision on a position's relevancy to your work history or the job at hand. If it's related to your career goals or industry, describe it just as you would a full-time role. If it's not related, simply list your title, the company name, and the dates you worked. For example, if you're applying for a mid-career position as a marketer, no need to share a lot of details about a sales associate job at a retailer. However, if it's your first full-time role as a marketer, part-time experience may be an important part of your resume. In the description of the job, highlight any skills that relate to marketing, such as arranging signage and promotions, signing up customers for store credit cards, etc. As with any job listed on your resume, keep the description focused on accomplishments and skills.